The new year came with a grim report, after South African authorities reported 1,004 rhinos were pouched in the previous year or 50% more than in 2012. Just six years ago, only 13 rhinos were slaughtered by poachers, but since then demand for rhino horn has soared. If the current trend is set to continue, than wild rhinos could become extinct by 2020, experts at Born Free Foundation say. “There are now just 20,000 white rhino and 5,000 black rhino left in the wild. If poaching carries on at the rate it is now for six more years it will devastate the numbers,” Will Travers, chief executive of the Born Free Foundation, said. “There will probably be no free-living rhinos as the remaining numbers will be fenced off in military-style compounds which are alarmed and heavily guarded by armed patrols,” Travers said, while speaking after attending a summit on wildlife crime in Pretoria, South Africa, recently. At $65,000 a kg, rhino horn, typically turned into powder, is one of the most expensive black market products, more valuable than platinum, gold or cocaine. It sells in South East Asia, where it’s valued as a key ingredient for medicine against diseases affecting the liver, fever, even cancer and hangovers. It has never been proven, however, that rhino horn can help in healing any of these ailments, which makes matters worse and particularly disheartening – free rhinos are slaughtered for nothing! “Poaching is a low-penalty crime and that has to change. We need better intelligence gathering and more equipment and manpower,” Travers said after the conference. 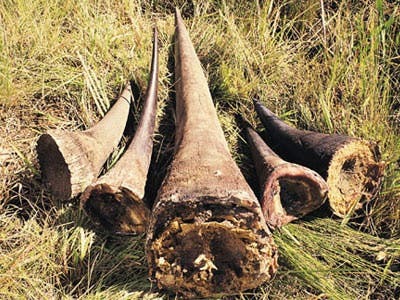 Clearly, poachers have become increasingly organized and dangerous as their resources grew along with the steep demand for rhino horn in Asia. Local authorities need to become even more organized, if they’re to save a whole species.